Cloud technology is evolving at rapid-fire speed, as evidenced by the investments behind the industry. Oracle is developing a program to help partners deliver its cloud software, platform, and infrastructure services to customers worldwide. Partners qualify for—and derive benefits from—OPN Cloud Program according to four membership tiers that reflect their level of expertise and investment in deploying Oracle Cloud services, as well as the “annual recurring revenue” they generate. 4i Apps Solutions is a fast-growing Cloud consulting firm helping customers interested in protecting their Oracle Application investments and help them achieve promised benefits and a Platinum Partner level member of Oracle Partner Network (OPN). Completing all promising criteria’s 4i have achieved the Cloud Select designation within the OPN Cloud programand shown success working with customers to launch Oracle Cloud services. 4i earn basic sales, implementation, support, development, and/or marketing assistance from Oracle. 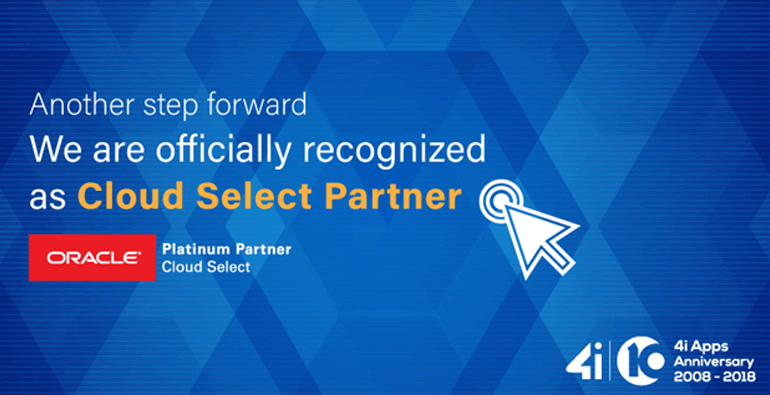 By achieving the Oracle Cloud Select designation, 4i have demonstrated success in implementing Oracle Cloud for customers in EMEA and has achieved specialization in Oracle Sales cloud, Oracle Procurement Cloud and Oracle IaaS.